Vembu BDR360 provides end-to-end visibility to all the backup jobs configured using the Vembu BDR Suite. 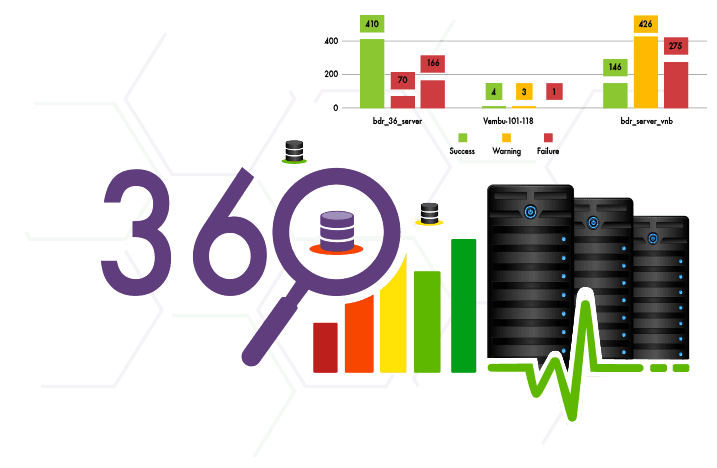 The centralized monitoring offered by BDR360 helps you keep track of all configured backup jobs. It also helps service providers enhance their productivity with the help of its extensive reports and email notifications. Most IT environments are heterogeneous, i.e., consist of servers running in both physical and virtual environments. The main challenge faced while backing up machines running in diverse environments is to ensure that all the backups that are running are scheduled without any errors. Monitoring each and every server day in and day out is very exhausting and resource-consuming. Businesses can address this issue by using Vembu BDR360. It monitors backups with automatic verification so that admins can track all the configured backup jobs from a single console. It indicates backup jobs that are causing trouble so that users can manually intervene and set it right. The extensive historical reports in BDR360 are also very helpful for analysis. Organize different backup environments or clients in groups and get collective reports and alerts for that group. Group Management lets you easily manage a large environment where multiple admins are running backup jobs. Users can manage all their client backups individually with the help of Server Information Reports, Client Information Reports, Individual Backup Status Report and Calendar View Reports. Reports are generated for every VM and its availability state. This report shows a clear picture of configured VMs with the backup and whether the particular VM is fully protected or not. Admins can get a report of snapshots of the console after mounting the backup in a machine. Also, this report provides the BDR Server’s mount and boot status for the backed up VMs. Users can backup reports for any particular day or a particular week. They can also categorize each day as ‘failure’, ‘success’ or ‘warning’ based on the backup job’s health for that day. Admins can view the health status of each backup configured in client or server. They will also get a detailed view of the latest job status and its history. Users can get instant notifications about each warning or error jobs within a single window. The notifications also provide insight into the reason for warning or failure. Administrators can categorize their VMs as ‘protected’ or ‘unprotected’ based on the most recent backup status for that particular VM. IT admins can configure settings to monitor all scheduled backup jobs in a single console. Vembu BDR360 backup server settings provide server name, product and version name with a build number, last connected time and the BDR360 status. Users can set up email alerts for their backup jobs on successful completion with a summary report. They can also configure emails at the Server/Client group level. Vembu BDR360 integrates with the Professional Service Automation (PSA) tool ConnectWise to create service tickets and automate the billing processes. It also provides an option for MSPs to speed up cash flows and run their managed service more efficiently and cost-effectively. Users can get an instant status of the backup jobs along with health-status. They can monitor the individual CPU usage and Disk usage of the systems configured for backup. The product itself is constantly improved and updated, and the Vembu support team is always on hand to assist with problems.